When it is hot and steamy outside, we don’t want to have a big heavy meal. On Saturdays we usually have brunch consisting of bread, cheese, a frittata or omelette, and a salad. This Saturday, I finally served two dishes I made from the Plenty cookbook, written by Israeli chef Yotam Ottolenghi. One of the dishes I made was butternut squash, that I roasted with freshly ground cardamom and allspice, and served with wedges of fresh lemon (I couldn’t find any limes in the market). I prepared a dressing of yogurt and tahini that was light and refreshing, and had a completely unexpected mixture of tastes. You can serve this as a meze (appetizer) with other salads, a first course, or a side dish. Trim off the limes’ tops and tails with a small paring knife. Dice the limes. Place them in a small bowl, sprinkle with a little salt, drizzle with one tablespoon of olive oil, stir, and set aside. Cut the butternut squash in half lengthways, scoop out the seeds and discard them. Cut each half, top to bottom, into 1/2 inch thick slices, and lay them out on a large baking sheet lined with parchment paper. Place the cardamom pods in a mortar, and use a pestle to get the seeds out of the pods. Discard the pods and pound the seeds into a rough powder. Transfer to a small bowl, add the allspice and the remaining 3 tablespoons of oil, mix, and brush over the butternut slices. Sprinkle with sea salt and place in the oven for 15 minutes or until fork-tender. Remove from the oven and set aside to cool. Peel off the skin, or leave it on if you prefer. Whisk together the yogurt, tahini, lime juice, 2 tablespoons of water, and a pinch of salt. The dressing should be thick, but runny enough to pour. Add more water if necessary. 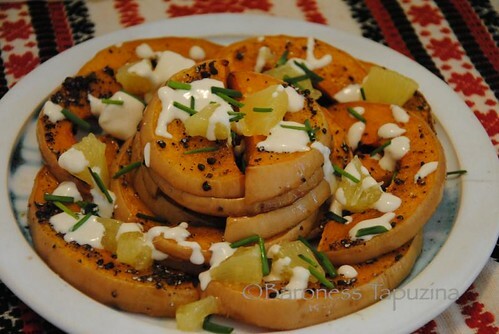 To serve, arrange the cooled butternut slices on a serving platter and drizzle with the yogurt dressing. Spoon over the lime pieces and their juices, and scatter the chilli slices on top. Garnish with the coriander or chives, and serve.